With the New Year just around the corner, the DMV wants to remind people about new laws or certain changes coming in 2019. One of those existing laws is now making it easier for anyone to self-certify their gender when applying for a Drivers License or ID. BAKERSFIELD, Calif. — It's the second day of the new year and the Department of Motor Vehicles wants to remind people about new laws or certain changes that come with 2019. One of those existing laws is now making it easier for anyone to self certify their gender when applying for a drivers license or identification. “I had to jump through hoops to go through my transition on my legal license and its taken awhile. I had to go through all of these medical hoops to get my forms signed and I needed a physiologist and a doctor,” said Allie Page, treasure of the Gen Club at CSUB. Two years ago Allie page came out as transgender but the process had its bumps. “If I didn’t have my physiologist on my side I probably wouldn’t have been able to go through the change,” said Allie Page. And it’s a change that can be pricey. “Along with comes fees and it adds up a lot – so it’s a very long and lengthy arduous process,” said Laura Haggard, board member of the LGBTQ group. Right now, the existing law says that if a person obtains clinically appropriate treatment for gender transition they are able to change their gender on their license or Id. 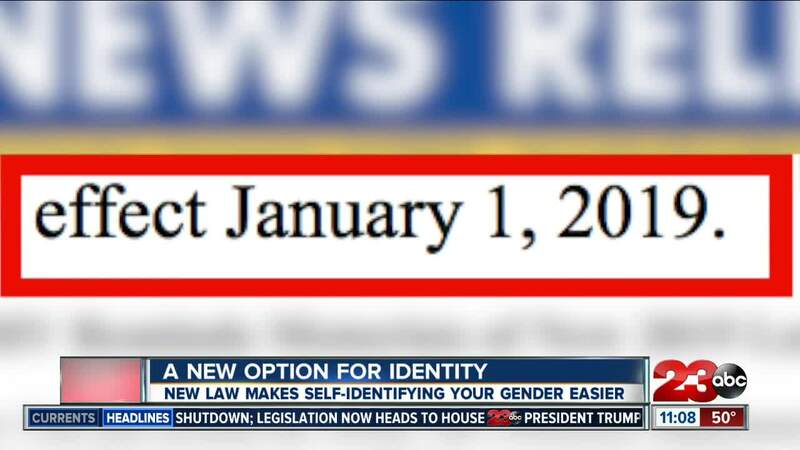 However, going into affect on January first of 2019, anyone will be able to self identify their gender. Haggard saying this new law will bring great relief to the LGBTQ community. The new law will allow people to choose if they identify as male, female or no binary. “I feel like the biggest change is for non binary people because there really hasn’t been much acceptance or knowledge of them,” said Allie Page.